REDUCTION - We are testing two new sets of motor/drives, one with an output of 22rpm and the other with an output of 125rpm. The extra reduction of the 22rpm output shaft raised the torque to 11.4kg/cm from 2kg/cm. This gives us around an 1/8th of a horsepower with all motors pulling together (96w) or looking at it another way we can lift 68lbs one foot in one second with this power output with the correct gearing. Or, we can attack an incline of 25% or 22.5 degrees (again lifting 68lbs one foot in one second) at four times the speed. Welcome to the wonderful world of applied mechanics and electrical machines. We have already tried a number of drives in various configurations that did not perform as well as we expect a 1/20th scale model that is to be used to simulate beach launching and landings. We'll be building a second set of eight caterpillar tracked bogies for trials in 2018. We'll report on how well the heavy duty 540 drives perform and comparing them to the 270 motor based units. SIZE MATTERS - The smaller units make it easy to fit in between the tracks for a true scale simulation. The 270 motor and gearbox has a relatively high torque output from a 9 volt motor, while the 33 motor and box is not really up to moving much. PACKAGING - The motor units were beautifully packaged for their trip over from China. 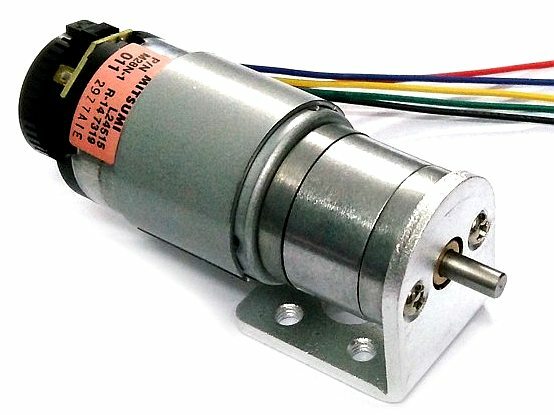 540 MOTOR & GEARBOX - The output speed from this motor and gearbox combination is 22 RPM. The 6mm output shaft means a bit more machining at this end, but we feel that it is worth having a reserve of power for our experiments.